When I’m doing my research for photography trips I always try to find a little hidden treasure that is not well known by other photographers. While researching my trip to the coast of Oregon last spring I found an article on Thor’s Well. Thor’s Well is a collapsed sea cave on the edge of a rock shelf that juts out over the Pacific Ocean near Cape Perpetua, Oregon. When the tide surges in water shoots upward through the hole and then drains back out. You have to check the tide tables because it is at its best right between high tide and low tide. Each time a wave comes in it is different. Sometimes it will only half fill the hole, sometimes it will fill the hole with a little overflow and sometimes it will shoot in the air with a dramatic overflow. There is no sign in front of the hole and there is no trail to it. You have to walk across the rock shelf and look for it. It took us a while but finally we spotted the water shooting up. Once you find it photographing it is tricky. 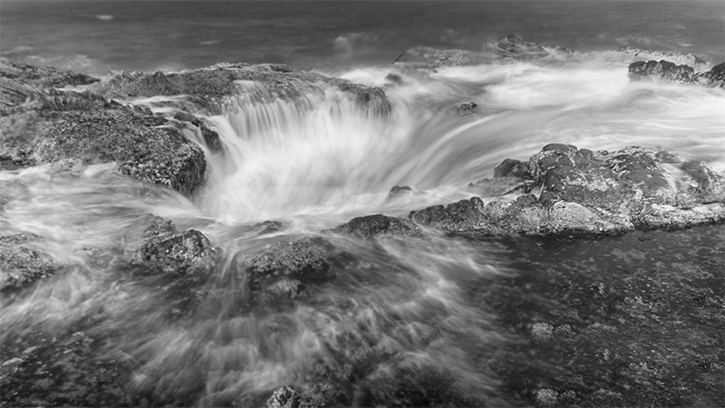 In between shots you have to clean your lens from the ocean spray while balancing on very sharp rocks. We stayed several hours the first time we found it and just couldn’t stop thinking about it the rest of the trip and altered our plans to go photograph it again. The next time you go on a photography trip try to find your hidden treasure. This entry was posted in Renee Lowery and tagged Fine Art Photography, Oregon, Renee Lowery Photography, Thor's Well, Travel on September 20, 2013 by rlowery711. These photos are exquisite. There seems to be no end to your talent and imagination, capturing and photographing the beauty of things often overlooked. Thanks for sharing.